the power of the action of "we"....not me. 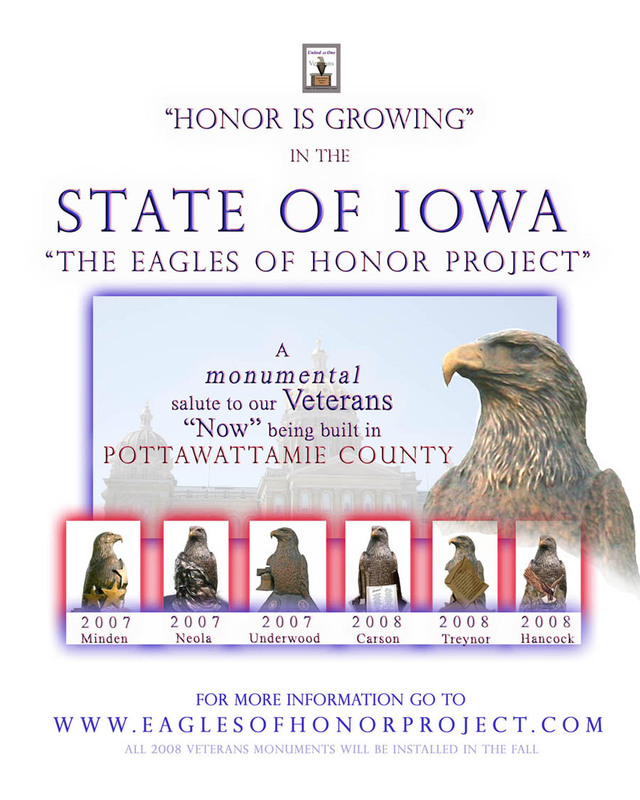 The "Eagles Of Honor Project" is about a county that is working together as a united unit to honor our Veterans. The county is Pottawattamie county. Pottawattamie county is located in the 'heart' of the United States, in southwest Iowa. What was once one man's vision of showing thankfulness, has turned into a heartfelt effort by many. Russell Christensen, of Neola, Iowa is that one man. 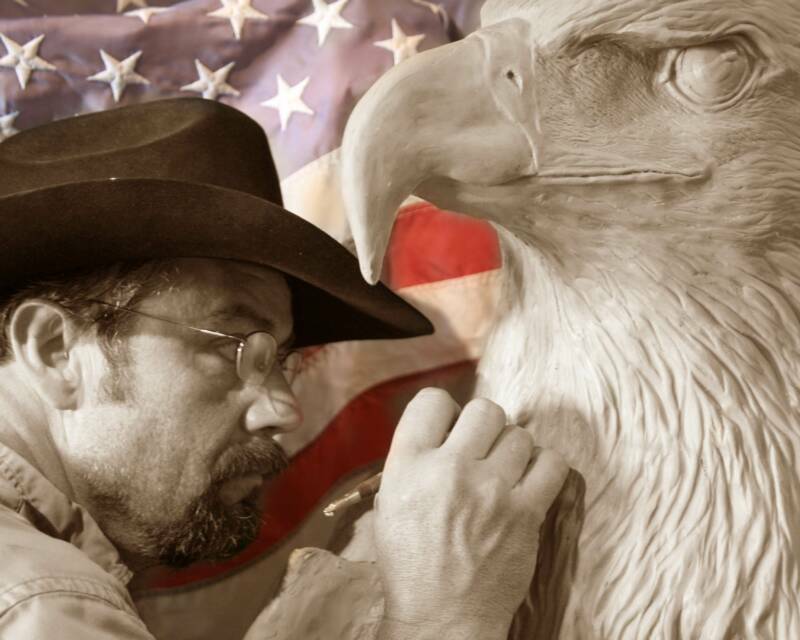 He is a bronze artist that lives and works out of his studio in Neola with his artist wife, Penny. When opening their business 25 years ago their goal was to make as much of a positive impact on their environment and lives as they could physically, financially and emotionally do. They equally agreed that they were given one life, and not to waste it. They believed that each person is given gifts when they enter this world and how they use them is up to them; those thoughts can either be positive or negative. They both chose positive and they both believe in reaching for the stars. Sometimes those stars are in the heavens and sometimes... they are on a flag. This is where the 'Eagles Of Honor Project' comes in. Two optimist members, Beth Kennedy and Teresa Goodsell, of Underwood, Iowa visited the couple and asked them about making a Veteran's monument for their local community center, UMBA Hall. After several months of meetings the project was underway. As the couple worked on the Veteran monument plans they remembered another person who had come and talked to them about possibly doing a Veteran's monument. It was the mayor of Neola, Don Fischer, and Neola is the town Russ and Penny live in. With this refreshed in their minds Russ called city hall. The council members agreed that, "Yes, a veteran's monument would sure be nice to have in their little town." Neola's Veteran's monument project was underway. Now if you would go to Neola and enter Russ and Penny's art gallery, Penny's Visions Art Gallery, you would find patriotism in their artwork; poems, bronzes, paintings. This was a perfect match to utilize their talents to create something that was already instilled into their hearts. As the couple created the art pieces on paper their minds began to wander and they dreamed of each of the little towns having a message of honor and thankfulness in their county that would be unique, educational, and grateful. What a message that would send to everyone's children to teach them to be grateful for the sacrifices of other people. Those 'People', being the people right there in their very own town. Those 'People', being the people that have made it possible for others to dream, to achieve, and most of all to make choices. Those 'People'... are our Veterans. Our soldiers of the past, present, and future...our Hero's! Russ and Penny thought maybe other towns would like their idea, so they set about finding out. They shared their ideas and their dreams with others. A dream to never let anyone forget their thankfulness of freedom and those people that made freedom possible. Some towns were overwhelmed with enthusiasm and some towns were skeptical. Russ and Penny understood them both. One town asked them, "What's in it for you?" Russ replied, " A job worth doing! People wake up in the morning and go to work. Some people go to work and they are teachers, you pay them to teach your children. Some people go to work and build you roads so that you may go where you want to go. Everybody has a job to make life a better place. My job of choice is to create art. Art that will make a difference in peoples lives and make them think about their own possibilities. I am taking my thankfulness and asking if you would like to share it and have it become our thankfulness. We live in America and the choice is yours. Would you like to join in the other towns and be united and remind the world what it is to be thankful, even if for only a moment. This is not about me. It is about us. Together we can accomplish a great feat or we can be silent." The couple said their thanks and left the group; later the town would join the group. That town was McCelland, Iowa. The littlest of all the towns. The town that will carry the purple heart symbol. The center of Pottawattamie county. They are proof that it's the little things in life that matter...and are remembered; for they are one of them. The 'Eagles Of Honor Project' was starting to take shape. People were telling others and the excitement was growing. Growing into the very thing it was designed to. Bringing people together for honor... with thankfulness. Thank You! Two little words, that can be so powerful and used so little, were being remembered. A change was taking place. Cresent, Iowa's town meeting was particularly memorable. Pete Sorensen ( a rock in this project) introduced Russ and Penny to the city council. The couple told them of their dream, which by now had turned into many people's dream. The City Council agreed it would be a nice addition to their town and they had several areas that they would love to improve. The meeting was over and Pete, Russ and Penny excused themselves. As they were leaving the building they could hear a gentleman from the crowd say, "I would like to give the first donation." Cresent, Iowa...a quiet town filled with substance of strength and knowing the meaning of working together. There are many stories about the many towns and as the months go by you will be able to read about the good times, the achievements and yes, some heartaches too. You see, no project ever goes perfectly. Why? Because it's people that make them happen and people aren't perfect. People are inspiring, encouraging, and uplifting as you will see in the stories that will unfold in the future of this project. I choose to remember these people and I hope you do to. As they are the ones shaping our lives to be better and with more understanding. Sometime in our life we take a leap of faith. Sometimes it's faith that makes us leap. INTRODUCTION OF THE ORIGINATION OF THE "EAGLES OF HONOR PROJECT"